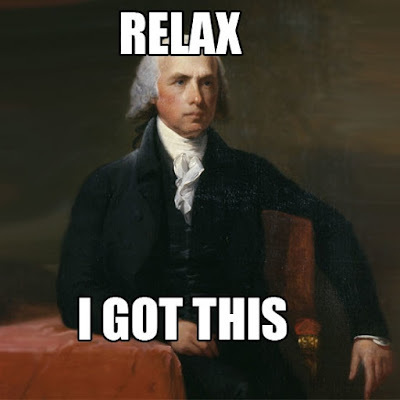 The Dividist Papers: Cognitive Madisonianism, splitting tickets, the 2016 Senate race, and why American voters are smarter than pundits and political scientists. Cognitive Madisonianism, splitting tickets, the 2016 Senate race, and why American voters are smarter than pundits and political scientists. The Dividist's new favorite phrase is "Cognitive Madisonianism." It's just another way of saying that American voters, in their collective wisdom, prefer and vote for divided government. Based on election results in the modern era, the assertion would seem to be unassailable. Since the end of WWII there have been 34 federal elections in the United States. In 22 of those elections, Americans elected a divided government. We chose divided government for 44 of the intervening 71 years or 62% of the time. We are currently in the 6th consecutive year of our most recent iteration with indicators pointing to divided government extending it's winning streak for at least two and probably four more years. Wait. Do We Do That On Purpose? That is the question. 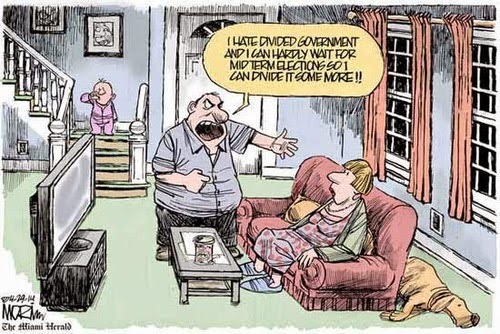 It's a simple fact that we vote for divided government far more often than not. It's that "cognitive" part that political scientists and pundits have a hard time swallowing. They just can't believe we are doing this deliberately. "Americans endorse high levels of governmental protections and services, but at the same time they consider government too big, too expensive, and too intrusive. They want somewhat contradictory things from the modern state, and they understand that the two parties differ significantly over the proper scope of government. Is it surprising, then, that a kind of cognitive Madisonianism in modern guise has emerged? The public wants to set the two parties' views of government's role in creative tension, with a Republican executive pushing one way and a Democratic legislature pushing the other way. " Since then, the parties have switched roles. We now have a Democratic executive pushing one way and a Republican legislature pushing the other way, but the principle remains the same. The term "cognitive Madisonianism" is now utilized as an umbrella shorthand description for the field of study where political scientists attempt to understand whether American voters are dividing the government with conscious intent. "American voters who favor divided government do appear to act on that preference, by voting a split-ticket... Voters who say they want to split control tend to vote that way, and that relationship holds up under extensive testing. American voters who were policy balancers, especially those moderates who see themselves as ideologically not for the opposition, also tended to split the ticket. By voting for the opposition party, they sought to curb party extremes and obtain a moderated policy mix. Overall, the case for the effects of the two components of cognitive Madisonianism—checking power and balancing policy—seems strong. " Which Brings Us To The 2016 Election And The Divided Government Vote. 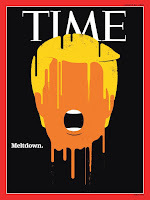 While it is unclear whether Trump is deliberately throwing the election because he is a secret Democratic Party plant, or lost support because he was outed as Putin's "Manchurian Candidate", or is a self-saboteur who really does not want to be President, or as a simple consequence of campaign incompetence - it is clear that he is losing badly. Nate Silver's 538 blog put's Clinton's odds of winning the White House at almost 90%. Sabato has the Electoral College at 347 - 191 for Clinton. Real Clear Politics has it 362 - 176. Yeah, "It's still early! ", "It always tightens by November!" "October surprise! ", "Trump will quit! ", "Wikileaks E-mails! ", yadda... yadda... yadda. Forget about it. It's over. The Democrats will continue to control the White House for four more years. Meanwhile, in the People's House, the GOP currently have a commanding 60 seat majority and Speaker Paul Ryan demolished a primary challenger. In an April post, the Dividist made the case that 116 years of history and the last eight flips in the House show the political conditions do not exist for the House to flip majorities this cycle. Despite all the drama of the Presidential campaigns, nothing meaningful has changed that analysis. A virtual lock for the continuing GOP majority in the House is confirmed by current polling. Sabato's Crystal Ball has Democrats picking up 10-15 seats, but falling far short of a majority. Election Projection has the Democrats picking up 18 seats, still well short. The Republicans will continue to control the House. So in 2017 the GOP will keep the House majority, the Democrats will keep the Executive branch and our government will stay happily divided regardless of what happens in the Senate. 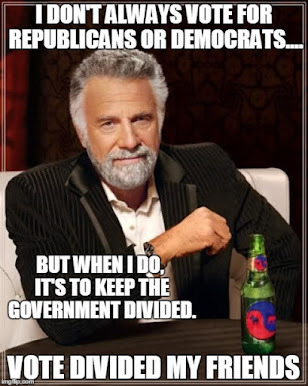 The Dividist voting heuristic strives to Keep It Simple Stupid and walk the simplest path of least resistance to keeping the government divided. In 2016, that path is to vote Clinton for President (or - at least - not vote for Trump), and vote to reelect your Republican Congressman. For the Senate - vote your conscience. Okay Fine. But What About The Senate? The best dividist reason to support a Democratic Senate is based on the fear that some "Black Swan", "October surprise" event (e-mails, Wikileaks, Clinton Foundation, Trump quitting the race, etc) will derail the Clinton campaign juggernaut sufficiently to let the GOP nominee be elected President. A Democratic Senate is a backstop to prevent Unified One Party Republican Rule. The best dividist reason to support a Republican Senate is based on moderating Supreme Court picks. If the Democrats win the Senate there is a real possibility they will implement a "Nuclear Option" rule change for Supreme Court nominees. That means a Clinton Presidency and Democratic Senate could steamroll a GOP minority and confirm anyone Clinton nominates for the Supreme Court. They might even withdraw Garland to nominate and confirm a more reliably liberal judge. Given the continuing catastrophe of the Trump campaign, the Dividist thinks hoping for a GOP Senate and moderation of Clinton picks for the Supreme Court is the better choice. "More than 70 Republicans have signed an open letter to Republican National Committee Chairman Reince Priebus urging him to stop spending any money to help Donald Trump win in November and shift those contributions to Senate and House races. The letter comes as a number of Republican senators and high-profile GOP national security officials have come forward saying they cannot vote for Trump." Can Republicans Really Keep The Senate Majority With A Clinton Landslide? "Donald Trump has been hit with bad poll after bad poll, nationally and at the state level, since the Democratic National Convention wrapped up last month — but it doesn't appear to be hurting too many Republican senators up for reelection. In states such as Ohio, Iowa, and Georgia, Trump's plummeting poll numbers haven't been detrimental to the incumbent Republicans on the ticket." It is gratifying to see the polling shows Americans are absolutely planning to split their vote, deny Trump the Presidency and separately consider Senate candidates and the GOP Senate majority on the merits. The Senate still hangs in the balance. Two years ago, almost to the day, the Dividist said that 2016 Senate control was a coin-flip. When we wrote this post in August, the Senate control was a coin-flip. With one week to go in the election: The Washington Post says Senate control is a coin-flip; Larry Sabato's Crystal Ball says Senate control is a coin-flip; and Nate Silver's 538 says Senate control is a coin-flip. Republican Toomey is still behind in Pennsylvania, but Republicans Ayotte and Young have pulled ahead in New Hampshire and Indiana. All are within the margin of error. So... it's still a coin-flip. 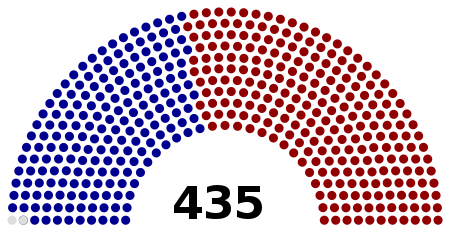 We'd like to say this will all be settled by Tuesday, but if the Senate majority is within 1 seat, it looks the fight for control of the Senate will continue throughout 2017 and beyond. Yay.